Whether you're 14 or 104, makeup can become an exciting part of your day. It's a special process that allows you to create an image of yourself that represents who you are. Between the eyeshadow, lip liner, foundation, and mascara, your beauty guru collection can often include mountains of products. This can make managing your makeup station more difficult than ever. Nobody wants a trash heap storing their beauty products; you want something hot! The best way to do that is to learn a few quick organization tips. These beauty hacks will transform your station from drab to fab in almost no time at all. So come on guru! Let's turn this living nightmare into a fairytale dream. Before you can fix it, you've got to come face-to-face with it. As much as we don't like to admit it, we're messy creatures by nature. We often look for the simplest solution, the quickest fix, and throwing things down without always returning it to its home is totally natural. This doesn't mean we should continue to do it, but it's okay if you have. No need to bum yourself out over some misplaced lipstick. We can fix it. Before you even think about cleaning up that disaster in your bathroom, you need to be ready to make a change. If you're not willing to commit to it, then what's the point? Think about it. Spending all this time learning makeup organization tips will do you no good if it's just going to look like a pig sty in a week. Be ready for a change, commit to maintaining that change, and you might just be in for the ride of your life! Before we can even get to organizing your makeup, we've first got to figure out what to do with all of it. If you're like most makeup users, you probably have a stash of makeup, in a drawer, bag, or box, that you hardly ever use but feel the need to keep. This is your “just in case” makeup stash. But just in case of what? What do you think might happen to all the other makeup your use daily that you'd suddenly have to resort to that eyeliner you grandma gave you for Christmas three years ago? It's time to say goodbye. We know it's hard and even heartbreaking at times to let things go, but seriously, it's time to get rid of that junk. Holding onto something just in case or for now is often your procrastination talking to you. Rather than getting rid of something you know you're never going to use, you just keep it for a speculated rainy day. Why? That is serving you absolutely no purpose and is taking up space that could be used for things you do actually intend to use. Throw it out now, so you don't have to deal with it later. They're things you bought with a specific night, beauty regimen, or look in mind. Perhaps you have a glittering lipstick or a pile of unused face masks. It's totally fine if you want to keep them, just use them. Go plan that night out with your friends! Set a reminder in your calendar to put on those face masks, so you use them every week. Figure out what you need to have happen to use that makeup and then go do it. Stop waiting around and make it happen. Since we're already throwing things out, we should probably get rid of some of that old stuff you have, even if you still wear it regularly. out. It does, however, have a limited lifespan that needs to be taken into account. If you let your makeup stay for too long, and continue to use it during that point in time, you put yourself at risk for potential bacterial infections. Which is why knowing just when their expiration dates are is crucial to your makeup organization and your overall health. Liquid foundation comes in a couple of different forms which can either lengthen or strengthen your makeup's lifespan. For those with a potted foundation, you're probably going to need to throw it away around the six-month mark. Perhaps up to eight but definitely not any longer than that. If you have foundation in a pump, you can actually enhance your makeup's lifespan to almost two years, giving you more time to utilize the product. Any sort of product that does not contain any sort of preservative inside it can only last about six months. Depending on the item and how often you use it, it may only be good for about three to four months. Think of these products more like produce at the grocery store. Without preservatives, these products expire far faster than other products on the market. That being said, they are often far better for your skin, face, and appearance. They are healthier and better for you, even though they'll have to visit the trash far sooner. This is your eye shadow, blush, powdered foundation, and anything of the like. These types of products can last significantly longer than a wet product, but it still will not last forever. Generally, you can keep these types of products for up to two years, but pay attention to it in the media. If for whatever reason, a company changes its formula, you should probably chuck that eye shadow. If you also notice a color difference or strange smell, you should probably get rid of that as well. Anything that touches your eye has a stronger chance for bacteria to grow, making it so much more important for you to toss stuff out when it's past its time. Your eyes are sensitive, and a bacterial infection is the last thing you need. For those of you using a regular eyeliner pencil, you can hold onto it for about a year. The reason this lasts so long is because you're able to constantly sharpen off the bacteria that had built up. If you use any type of gel eyeliner, either in a pot or in a stick, you're only going to get about six months out of it. Mascara has one of the shortest lifespans on this list because of the way people use it. Generally, you're only going to be able to get about three months out of your mascara. Potentially up to six if you do not frequently pump your mascara. Doing this actually causes air to build up inside, which can then dry out the product and make it clump. If you take care of your products, they'll take care of you. Lipstick, when well maintained, can stay good for over two years. Be sure to wipe them off after you use them and store them well to keep them clean. If you begin to notice anything strange about the way the color looks or the texture feels, it's probably time to throw it out. Finally! You've gotten rid of all your junk and are only left with the items you use in your daily life. Now it's time to get creative. Space can often be limited in your life, but you want to have easy access to your makeup while you use it. The best way to do this is by creating fun makeup organization storage containers. Buying containers similar to this is also a valid option if you do not have the time or materials to make it yourself. To get you excited about the idea, here's a fun video with a ton of great makeup organization tips for your own makeup station. If you know your schedule is tight or just do not feel like you're super crafty, don't fret! 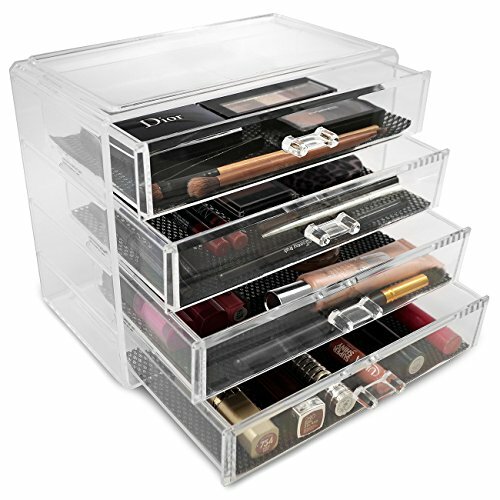 There are a ton of great makeup organization bins available online for you to purchase. These products will cost a bit more than if you simply made them yourself, but they often have some unique features you may not be able to make on your own. This makeup organization bin is designed to carefully stack and hold all your eye shadow palettes. Each one will have its own comfortable home in this clear, durable piece. It has the storage capacity to hold up to eight different palettes, with each of the spaces being wide enough to fit palettes of many sizes. 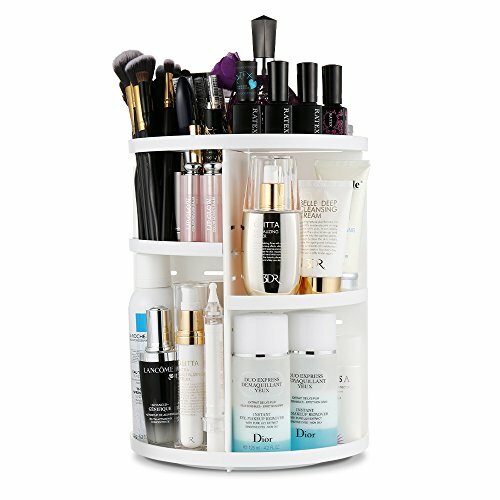 For those with a lot of small bottles of products, check out this rotational makeup organizer. While its size is small enough to fit on your counter, it has the ability to fit nearly 30 brushes, 20 bottles of product, and a multitude of other lipsticks, nail polishes, and eyeliners. It comes in multiple colors and shapes, the shelves are adjustable to meet your personal needs, and it comes with its own Jerrybox guarantee. Everyone loves having a good selection of lip colors, but if you've got a lot of them, check out this lipstick rack. 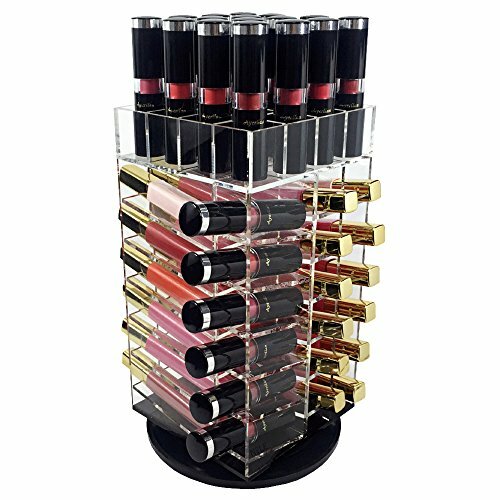 This makeup organization device can hold up to 52 different lip products, including lipsticks, lipgloss, lip plumper, and even chapstick. All the products sit neatly and comfortably in the rack that spins around 360 degrees for easy access. 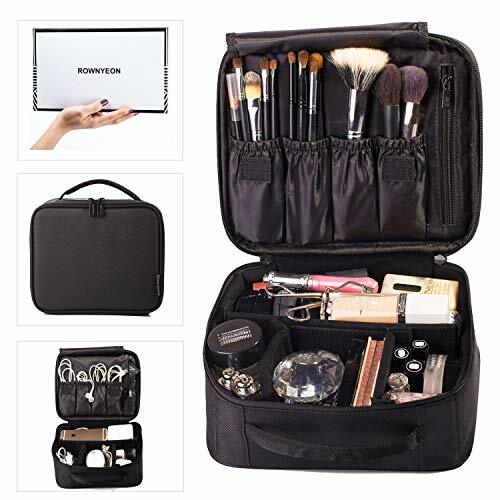 Coming in a variety of colors, this four drawer makeup organizer allows you to neatly store away any product you wish in any fashion you choose. Each drawer can fit a variety of products inside, including brushes, palettes, eye liner, mascara, and more. 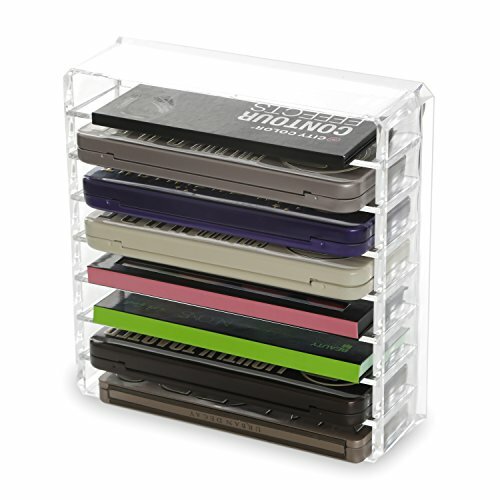 It is simple to use, easy to access, and a great way to keep things tidy. Having your products organized at home may seem simple, but keeping it together while you're on the go is a whole other story. This traveling case provides individual compartments for each of your products, making packing simpler than ever. The bag is waterproof and shake-proof, meaning that your items will not jostle around inside the bag even if the bag gets shifted during travel. If purchasing a bin just isn't in your budget, or if you really want something that you can personalize to meet your own unique style needs, perhaps it's time for some DIY. Creating your own DIY makeup organization storage units can not only help save you money but encourage you to use the storage units you have. Since you made it to match your style, you'll feel more inclined to use it after each makeup application. Each of the makeup organization crafts we're going to show you can easily be adapted to fit your space, preferences, and budget. Have fun and get creative! When you don't know what to do with something, just stick it on the wall! The magnetic makeup board is a great way to get things off the counter, out of your way, but still, make it easy to access. Plus, you can clearly see your options in front of you, encouraging you to use all your products instead of just a few. The first thing on your to-do list is to get all your supplies together. Head over to your local thrift store and find a large photo frame. It doesn't matter what's behind it as you'll be able to cover it up later. You'll also need a metal sheet large enough to cover the size of the frame and some cloth to cover up the ugly metal. Be sure the fabric is thin enough to still allow the metal to do its job. While you're at the craft store, pick up some small magnets (shape does not matter), spray adhesive, and paint to match your fabric. If you want to hold brushes and eyeliner on your board, run to the dollar store to find some sturdy, durable plastic cups. The way this board looks is up to you. Whatever style and color you're looking to get is perfectly acceptable. Be sure to paint your frame first, giving it ample time to dry. Once that's done, cut the metal sheet to fit inside the frame. Then take your spray adhesive and place the fabric on top of the metal sheet. After it's dry, place the metal sheet inside the frame and boom! Your board is complete. Time to slap on those magnets! Pull out all the makeup you want to hang and put a small piece of the magnet on the back. If you bought those cups, put a line of magnets vertically on the cup. All that's left to do is to put the two together. Arrange your makeup on the board in whatever way you see fit. Slide brushes, mascara, and other small objects into the cups and attach the cups. Hang the board on your wall, and you'll never have to worry about your makeup being out of sight. For something a bit simpler, check out these brush storage containers. You can organize and label your brushes however you choose, making it both stylish and practical. All you really need for this is some type of container and some decorative stones for the bottom. We suggest getting clear, glass containers so you can see the stones inside, but colored containers work just as well. You may also want to get a few items to decorate your containers. This could be things like ribbon, letter stickers, false eyelashes, or glitter. Nothing too complicated here! All you have to do is put the stones into the containers, leaving some room at the top. Then apply any of the decorations you have chosen, possibly labeling which container is for which type of brushes. Grab all your brushes and stand them inside the containers. Thanks to the stones, they'll stay wherever you place them, so the brushes you use most frequently can always be stood in front. Another simple solution is made out of old gift boxes. Rather than throwing them away, use them as a way to separate and organize your makeup inside a drawer or cabinet. This is probably the most affordable craft we have listed, and it makes for a lovely DIY aesthetic. Depending on how much makeup you have, you'll need a varying amount of gift boxes. We recommend choosing boxes that are smaller rather than large. These boxes will fit better into your drawers and help you condense the number of things you're aiming to keep. You will also need some hot glue and potentially a selection of decorative paper, but only if you are unhappy with the pattern of the gift boxes. You're first going to want to determine how deep you want your boxes to be. Cut the excess depth out from the edge of the box, making sure all your boxes are the same height. Now comes your opportunity to get creative. Based upon the sizes of your boxes, you can arrange your layout however you want. Maybe you want vertical rows, horizontal rows, a square here, rectangle there, whatever you want! Once you have decided on your layout, and are sure that it will fit into the space you want it to fit in, it's time to bring out the glue gun. First, glue in your decorative paper, making sure to fit it in tightly into each corner and carefully covering the four sides. Then, glue the edges of the boxes together in the order you have laid out, creating a single unit. All that's left is to slide your organizer into its place and fill in the boxes with your makeup. It works best to separate your makeup, giving each box its own specific product. That will make everything easy to find, simple to keep organized, and gorgeous to look at. Do I Still Need to Clean This? The simple answer is yes. Of course you need to clean it. Having good products and good makeup organization is key, but you need to make sure your tools are just as clean as your station. Your makeup brushes need a lot of maintenance in order to do their job. Letting product sit on the brushes can cause it to get unhealthy amounts of build up and potentially grow bacteria. Plus, without a healthy cleaning regimen, your brushes may begin to fall apart faster than you'd hoped. At the very least, you should aim to give your brushes a thorough clean at least once a week. This is especially important for brushes that are used to apply or blend things like foundation. Without this, you can begin to experience spotty application, making your entire makeup process a mess. Get rid of that unwanted oil, product, and debris and get back to clean, healthy applications. Let's stop you there. There's no need to go out and buy expensive product cleaner or follow some complicated routine. All you really need is some warm water and a bit of soap. Brushing Off Your Brush's Funk. Step 3: Carefully massage in the soap between the bristles of your brush. Step 4: Rinse all that soapy goodness out. Step 5: Get rid of the extra water built up in the brush, but do not ring it out. It is not a towel. Step 6: Reform the bristles of the brush to its original shape. Step 7: Place the brush on your counter with the bristled head hanging over the edge. Do not let it sit on a damp towel to dry. This will misshape the brush and make it more difficult for the water to evaporate, potentially forming mildew. Step 8: Repeat the process for all the other brushes in your collection. Step 9: Place the brushes back into their original homes and enjoy using them once again! You did it! You successfully cleaned out your makeup situation and organized it like a true beauty professional. How do you feel? You should be feeling great. Having a bit of organization in your life can clear up the clutter on your counter, but also some of the clutter inside your brain. When things are neat, and under your control, you begin to feel better about your life, your home, and your situation. While it may not necessarily make all your problems go away, it can help improve the way you feel about those problems. Just think, if you were able to conquer your disaster of a makeup station and turn it into something spectacularly organized, what can't you tackle? Now that you have your makeup organization in place, it's time to put that makeup to good use. Get creative, have fun, and show the world your talent. While applying makeup may seem like a simple routine, it's actually an art form that allows people to express themselves for who they are. Makeup is for everyone, regardless of your background, age, or gender. Embrace your inner artist and begin to experiment with something new. Just please, for the sake of every beauty guru ever to exist, keep that stuff tidy. Nobody wants to see that mountain of mess ever again.